Find it difficult to retrieve change you drop down between the seat and the console in your car? Well here’s a bit of unnerving news from 1910 Lakeville. Passengers Fled from Car Near Lakeville. Workmen Dropped Stick of Explosive, but No One Hurt. Excitement prevailed on the electric car from Elliott’s Corner [East Taunton] to the Lakeville town house [October 31] afternoon, when it was discovered that a workman who was on his way to New Bedford had dropped a stick of dynamite between the window sash and the car seat. The stick of the explosive was small and just fitted in the slot where the window slides down between the side panels of the car. It was noticed that the workman was trying to recover something from the small cavity, and when asked by conductor Cornell what he was doing he answered that he had dropped a stick of dynamite in there. The passengers at once became panic-stricken. Motorman Frazer and the conductor thought of the wires concealed there and saw visions of the car and passengers going up in the air. It was decided to stop the car and allow the passengers to walk to the town house, a short distance away. The car was run slowly to the car barn five miles away, extra precaution being taken against any great jar. Master mechanic Edward Robinson fished the stick out with a wire, and it was exploded in the woods in the rear of the station. The passengers, after recovering from their fright, took the next car to [Middleborough]. Traffic was delayed only a short time while a car was being substituted. Lakeville trolley car with Lakeville Town House in the background, c. 1900. 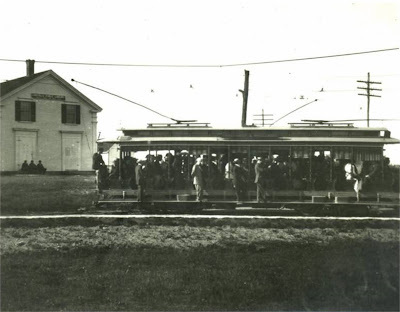 The trolley mentioned in the article would have been an enclosed trolley that typically replaced the open trolley pictured here which was used during the warmer months. Boston Globe, "Dynamite Scare", November 1, 1910.